This module is the last in the Brain Power! program. 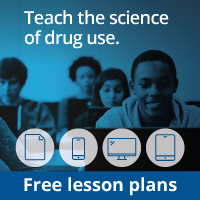 Over the past five modules, the students have thought about society’s views toward drug use and have learned about the structure of the brain, how neurotransmission works, and how stimulants, alcohol, marijuana, and inhalants affect the brain, the nervous system, and the body. During this mission, students round out their knowledge of drugs by learning about addiction. Then they revisit their ideas about the impact of drug use on society and have the opportunity to modify their thinking based on new knowledge. Students discuss how addiction relates to the drug abuse problem in this country. Students rethink the scrapbooks they developed during Module 1to reflect their new ideas about drugs.